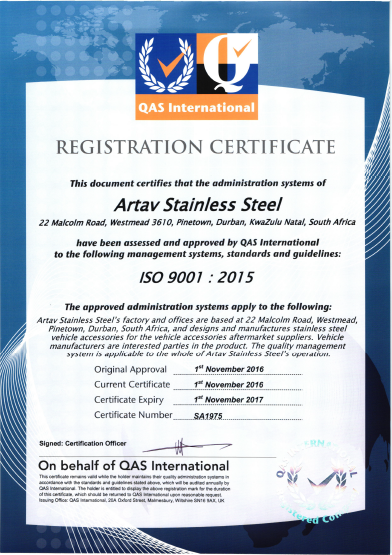 Artav Stainless Steel maintains the highest levels in terms of product testing within the SA market for OEM parts. Our Product Engineering Department runs simulations involving Air bag Compatibility, Load Testing, Vibration Testing on Brackets and SABS Testing on Towbars. As and when parts have passed engineering simulations, we then move onto physical testing. This is often done in Australian due to the lack of test facilities in SA that specialises in these types of products. Artav Stainless Steel manufactures a wide range of Nudge Bars for nearly all 4×4’s and SUV’s in the South African market. Each Nudge Bar is designed and tested for Air Bag Compatibility and comes with a comprehensive Insurance Policy. Our design department also runs endurance and vibration tests before signing off any new Nudge Bar for manufacturing. Artav prides itself on designing a range of Tubular and Oval Tube Nudge Bars, all of which come with the branded vehicle model names. Artav Stainless Steel focuses mainly on Stainless Steel but also has a popular range of Black Stainless Nudge Bars. All of our Sports Bars / Styling Bars are designed to give a bolder and more enhanced look and visual to the vehicle. Our latest range is Canyon Style Sports Bar. This Styling Bar design is fast becoming the new trend in Sports Bar concepts for local OEM’s. This range was designed with the American market in mind as the product follows the larger than life American attitude. Our popular range of Sports Bars with Oval Side Plates is a definite must for all 4×4 owners looking for great value for money. These products follow the standard Sports Bar design and utilise black rubbers with an Oval Side Plates with the vehicle name completed in a domex decal with automotive sealant. All Sports Bars are endurance and vibration tested to ensure only the best quality for our customers. Artav Stainless Steel produces 5 different ranges of Side Step accessories for the South African market. Oval Double Tube Side Steps – These are our “Big Boys” of the range. The wider Oval Step has been dubbed as the perfect Side Step in South Africa. This Side Step is Load Tested to 200kg’s to ensure its perfect for SA market conditions. It also has a large Step Pad with added tread for grip. This really is our most popular seller and by far the best Side Step in the market right now. Standard Round Tubular Side Steps have been replaced largely by the new Oval Style. Our Round Tube Side Steps are still found on many of our older model designs. Artav Stainless Steel is an OEM and New Car Dealership supplier of high quality Stainless Steel accessories. In order to be accepted as a vendor or approved supplier by international vehicle manufacturing companies, one has to comply to certain standards. Artav has a strong Engineering and Development Division to ensure new designs and latest trends on all new models released, while ensuring optimal Production Capacity to cope with the likes of Ford, VW, General Motors, Etc. Artav Stainless Steel ensures quality of its material and products by controling all aspects of the production process, as well as the manufacturing of its own tube. This enables us to supply high quality parts at the best possible pricing – as none of our key components are outsourced. We make use of 1st World Test facilities in Australia to test our Nudge Bars for Air Bag Compatibilty. This test is conducted by using a sub frame of a vehicle and running an actual crash test scenario to verify the bar and brackets will have no negative effect on the air bag systems. This type of testing is also backed up with a comprehensive liability insurance policy to cover any product defect / failure in the market regarding Nudge Bars and Towbars. Artav Stainless Steel is proud to boast that we have not had any insurance claims to date for the last 20 years of manufacturing these safety critical products. This is a true testament to our Engineering Division and comprehensive testing involved in each part before being approved for mass production.